UM pharmacy students present research posters at the 2015 Rho Chi Research Day. Erin Holmes, associate professor of pharmacy administration at UM and treasurer of the chapter, said the event is a great way to learn about the pharmacy students’ research. Cody Taylor, a fourth-year pharmacy student and president of the UM Rho Chi chapter, believes the research day is an opportunity to gain experience and receive feedback from peers and faculty. John Bentley is chair of the pharmacy administration department and a faculty co-adviser of the chapter. 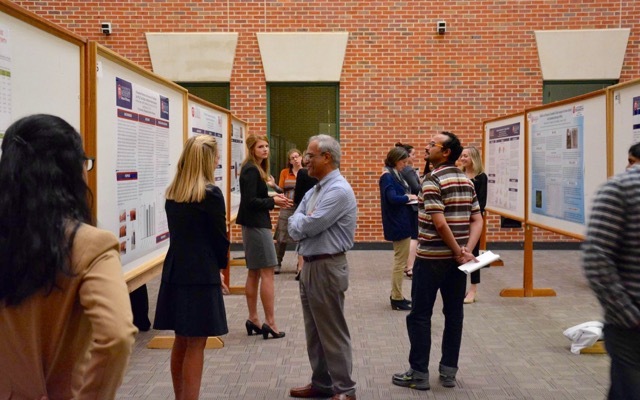 “Ideally, it demonstrates to the student researchers, and possibly other students who view the posters, that conducting research can be engaging, rewarding and enjoyable, hopefully leading students to pursue other research opportunities in their careers,” Bentley said. The Rho Chi Research Day will be held Tuesday, March 21 from 9:30 to 11 a.m. in the atrium of the Thad Cochran Research Center. All are welcome and refreshments will be provided.